The Christopher B. Duro Fellowship is a merit and need based fellowship for Native students pursuing graduate study to help the advancement of Native communities. Students who are chosen to be Duro Fellows will be eligible for up to $25,000 per year, based on need and will be required to perform community service hours with the Southern California Tribal Education Institute and publish a scholarly article. Preference will be given to first-generation Native graduate students. Incomplete applications will not be reviewed! The Native Arts and Cultures Foundation (NACF) today announced a call for letters of intent for the Foundation’s 2011 grants. The three categories include: Artist Project Grants; Mobilizing the Community; and the Regional Collaboration Pilot Program. NACF’s grants support the artistic creativity of American Indian, Alaska Native and Native Hawaiian individual artists, programs and organizations. This year, grants will be awarded in three categories: Support for Individual Artists (2011 Artistic Innovation Initiative); Support for Communities (2011 Mobilizing the Community Initiative); and Support for the Field (2011 Strengthening the Arts and Cultures Infrastructure Initiative). The Artistic Innovation Initiative will support individual artist projects that engage community members in new ways. Grants up to $10,000 per artist will be awarded. The Mobilizing the Community Initiative will support networks of artists, with particular consideration given to organizations presenting arts conferences, convening artist gatherings, or supporting master artist-to-artist residencies. Awards will be up to $15,000 per project. The Strengthening the Arts and Cultures Infrastructure Initiative will focus on organizations providing support for arts and cultural activities. Particular consideration will be given to organizations that do at least one of the following: re-grant; offer professional development opportunities; focus support in a particular field or practice; and/or provide unique opportunities to artists in national arenas. Awards will be up to $40,000 per organization. Visit website for criteria and guidelines. This position is responsible for assisting with developing and directly administering the Wakanyeja “Sacred Little Ones” Project for the American Indian College Fund. The Wakanyeja “Sacred Little Ones” Project is a development of the American Indian College Fund, working in collaboration with the W.K. Kellogg Foundation, to support tribal colleges and universities in the provision of high quality early education services. These services include early childhood programs, teacher certification and curriculum development, parent involvement and training, coordination and alignment of community resources and the collection and dissemination of best practices. All services are focused on learning outcomes that prepare American Indian children and other vulnerable children in Native communities for kindergarten entry and later school success. Please email a letter of interest, salary requirements and resume to: applications. Time Immemorial follows two spirits, Tulu and Miti, raven and eagle, as they are born and reborn throughout all of Alaska Native history, from Creation, through pre-contact, arrival of missionaries, the Great Death, boarding school, statehood, ANCSA, oil development/global climate change, and other modern challenges. Written by and starring Alaska Native artists Allison Warden and Jack Dalton, they each play nine different characters, brothers, husband and wife, elder and child, sisters, mother and son, father and daughter, grandmother and grandson. You’ll laugh through your tears, and, we hope, in the end, you’ll see our ancestors as they really were, real human beings doing the best they can. We humbly ask you to join us for this once in a lifetime experience, one weekend only! We were here in Fairbanks on February 5th for a staged reading, and now we have returned with the full production which includes lights, sound, props and a set! Our tour so far has been received enthusiastically and we are excited to give back to the Fairbanks community. 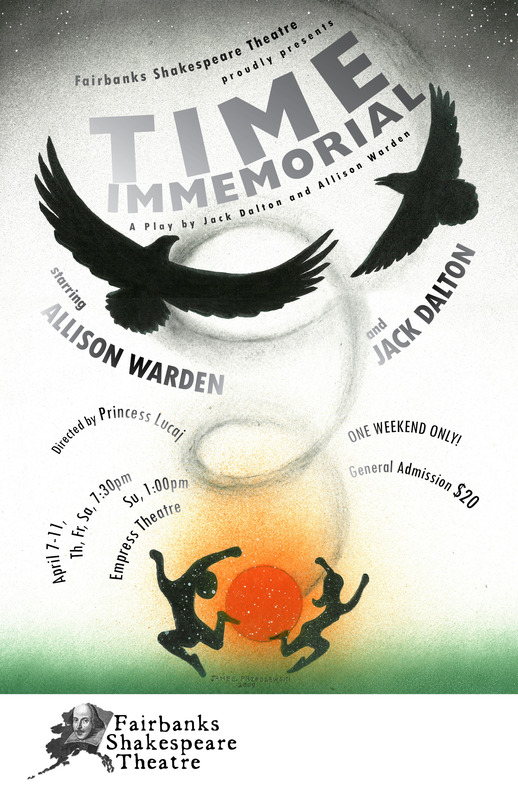 We are returning to Fairbanks, this time with a FULL producion of Time Immemorial at the Empress Theatre through the Fairbanks Shakespeare Theatre Company on Thursday, Friday and Saturday, April 7th, 8th and 9th at 7:30PM and on Sunday, April 10th at 1pm. Tickets are available NOW online at www.fstalaska.org. Time Immemorial was work-shopped and revised in 2009 at Native Voices at the Autry, in San Diego, and is now a development play at Native Voices, with its first equity production in Los Angeles in 2012. Time Immemorial has already toured Homer and Palmer, and is going to tour Fairbanks, Anchorage, Nome, Valdez and possibly Kotzebue. Don’t miss this chance! For questions, contact Allison Warden, Uyalunaq Productions, P.O. Box 110522, Anchorage, Alaska 99511, (907) 242-4663. Develops, implements, analyzes, and adapts direct response Annual Giving Program, including mail, telephone and electronic outreach to ensure program growth through renewals and acquisitions. Responsible for review and communication to ensure accuracy of gift and donor data related to this program. Coordinate and implement donor acknowledgement process for the direct response Annual Giving Program and Monthly Giving Program. SITKA —Applications are available for the SouthEast Alaska Regional Health Consortium Summer Internship Program, which provides work experience for Alaska Native/American Indian students pursuing careers in health care. The program provides opportunities for six Native students — two high school, two bachelor’s degree and two master’s degree/clinical level, allowing for exploration in career options in health care, and the interns receive valuable on-the-job training in their health care career of interest and a minimal hourly stipend. At the end of the program, interns will receive a performance evaluation with valuable feedback from their mentor. To qualify for this program, students must be enrolled tribal members or descendants as certified through a Certificate of Indian Blood (CIB). They must currently be enrolled in high school, college or vocational school and attending full time. And they must be in good academic standing with a minimum GPA of 2.5. In order to apply, students must complete a SEARHC Summer Internship Application, a SEARHC job application, provide two letters of recommendation, a copy of the student’s current resume and a copy of the student’s current college transcripts. The application deadline is April 15, and the final selection of interns takes place on April 30. The internship program runs from June 20 through Aug. 15. Completed applications may be mailed to Romee McAdams at SEARHC, c/o Human Resources Department, 222 Tongass Drive, Sitka, AK 99835. Applications also can be faxed to 966-8404, or scanned and e-mailed to romee.mcadams@searhc.org. Because space is limited, interested students should apply early. Application packets are available at Southeast Alaska high school offices, through local tribal organizations or by going to http://www.searhc.org/common/pages/studentinfo/internships/index.php . AISES will be putting on an Native Youth Olympics tournament and inviting Alaska Native Science and Engineering Program (ANSEP) and University of Alaska Anchorage Native Student Services students to participate. If you could send this out to your mailing list that would be greatly appreciated. The events are to be determined depending on the interest in each event. We will have a stick for stick pull, a stand and ball for high kicks, and a wrist carry stick. There will be concessions sponsored by AISES, fry bread, and chili for sale. Anyone that would like to come and view the event is welcome to do so. This will be an excellent way to get the Native community together for some fun. There will be prizes such as Orso’s and Alyeska gift cards and some summer stuff such as a barbecue and a tent and similar items for the first place winner of each event. There will be a total of six events occurring. For questions or comments contact Arthur S. Stevens (Cen’ayy), Civil Engineering Student, University of Alaska Anchorage at 907)433-9866 or a_stevens87@hotmail.com.